I bet you are thinking to yourself, "What the heck is Souvlaki?" No? I know I had no clue, so I looked it up. According to Athens Guide, Souvlakis were the hamburgers of Greece until actual hamburgers arrived on the scene. Souvlaki usually refers to meat of some sort, beef, lamb, pork or 'unknown' (Guess this is where Soy fits in!) that is on a giant vertical rotisserie and is known as gyro pronounced here in the United States as gyro and in Greek as yee-row. 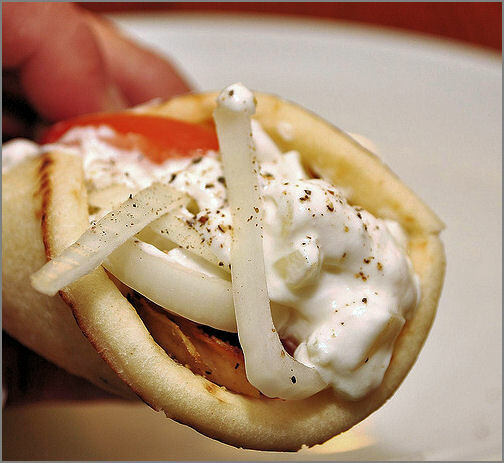 The souvlaki chef slices off the meat as it becomes done and puts it on a round pita bread with lettuce, tomato, onions, and sadziki, a cucumber-yogurt-garlic sauce. Well, we won't need a rotisserie for this recipe, but ours will be just as delicious! Let's get started. Note: This recipe can be found in Good Housekeeping's one-dish meals: 100 delicious recipes . I love this cookbook because it helps busy home chefs put meals on the table faster. Each Serving is about 390 calories, 24g protein, 45g carbohydrate, 13g total fat, 9mg cholesterol, 945mg sodium. In nonstick 12-inch skillet, heat olive oil over medium heat until hot. Add the onion and cook 12 to 15 minutes or until it is tender and golden; stir occasionally. Add the burgers, pepper, and 1/4 teaspoon salt, and cook 5 minutes or until heated through. Meanwhile, in a medium bowl, stir the yogurt with cucumber, mint, garlic, and remaining 1/4 teaspoon salt. Add burger mixture to the medium bowl and toss gently to combine. Cut 1-inch slice from each pita to form an opening. Reserve cut-off pitas for crumbs for another day. Spoon one-fourth of the burger mixture into each pita. Sprinkle with tomato and feta. lol - this is about as good as Hagar singing for Van Halen again!